Back in 1992, the Thai Government approved the establishment of a state enterprise for the creation of the Mass Rapid Transit Authority (MRTA) in Bangkok and its surrounding areas. The need for mass rapid transit was essential to enable the rapidly growing population to move quickly and easily around the region. Pandrol supplied fastening solutions for the Purple and Green Line South, which were completed in 2016 and 2017 respectively. Green Line South: 12.6 km from Bearing to Samutprakarn. 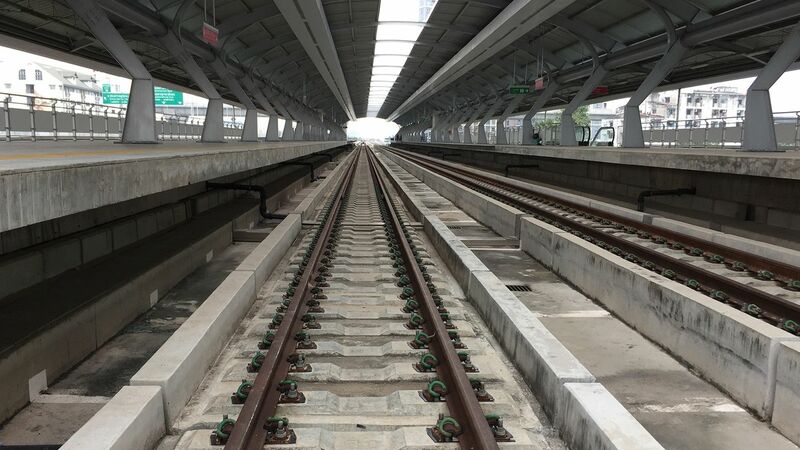 Both lines were delivered with Pandrol’s Double Resilient System (DRS), and additionally, Pandrol supplied Aluminothermic welding and the Pandrol QTrack® embedded rail system for the depot areas. The company also designed and supplied a complete composite conductor rail system for the electrification of these lines and this system is being developed for Green Line North. These were major projects in terms of volumes, with Purple Line involving 184,000 rail seats, Green Line South using 97,000 rail seats, and the upcoming Green Line North project requiring Pandrol to supply 140,000 rail seats, giving a total of 421,000 rail seats over the three projects. 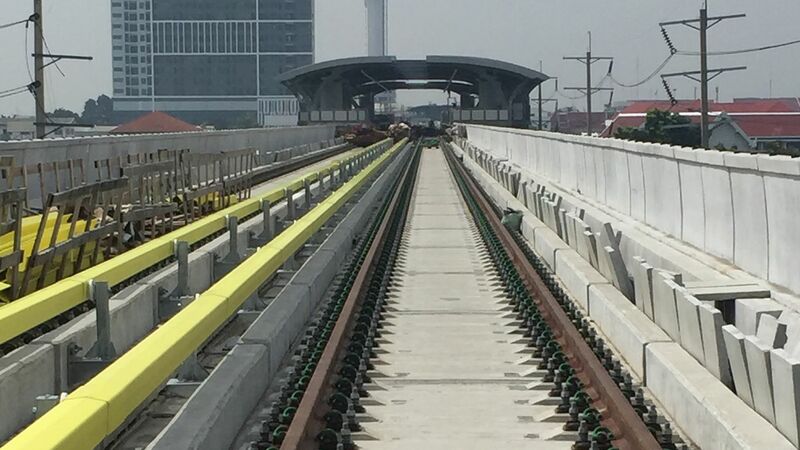 Pandrol’s DRS system was also recently specified for the northern extension of the Green Line elevated railway. This is operated by Bangkok Skytrain system and involves approximately 19 km of track in a densely populated area close to Bangkok. Green Line North, which is due for completion in 2019, will carry axle loads of up to 17.5 tonnes. For Green Line North, Pandrol introduced a new construction method which allowed the contractor to concrete up to the baseplate in one possession, dramatically improving construction productivity, by reducing installation time. The Pandrol DRS system features a Pandrol e-Clip baseplate, mounted on a studded natural rubber pad that provides resilience. This can be tuned, within limits, to suit specific axle loads and stiffness requirements. The system is suitable for all rail inclinations and rail types and is optimised for top-down methods of construction, or bottom-up methods with alternative anchorage. DRS reduces the transmission of low frequency noise and vibration due to its low stiffness. Pandrol’s DRS provides the advantages of an indirect rail fastening system, distributing the vertical deflections between the rail pad/clips and the baseplate pad/compression springs and separating the functions of the anchorage and rail fastening. 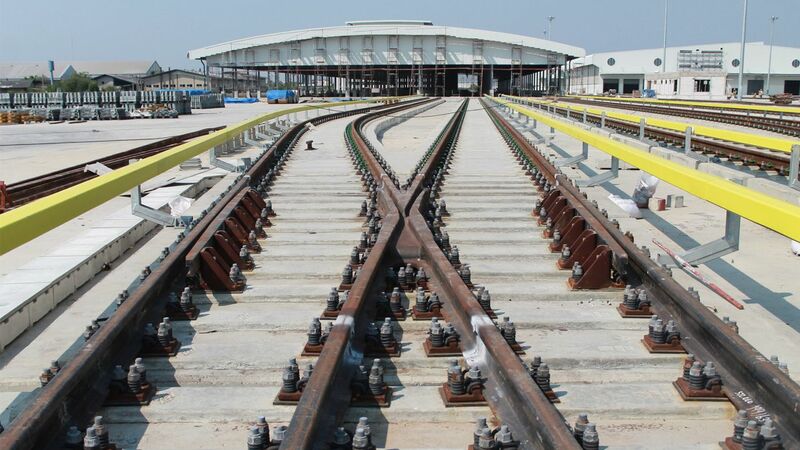 To cater for the interaction between the rail and the track structure, low toe load and/or zero longitudinal restraint (ZLR) fastening options are available. The coil springs and baseplate pad absorb most of the vertical deflections and also play a part in countering the effects of end rotation where simply supported beams form part of the viaduct structure. Vertical and lateral adjustment is provided for construction/maintenance requirements. Vertical adjustment typically up to 20 mm and lateral adjustment through lockable eccentric bushes (± 3 mm per rail and ± 2 mm by differential side post insulators) total ± 5 mm per rail. Pandrol’s DRS system is popular with contractors as it enables quick and simple installation. The system is installed on cast in-situ concrete plinths. The assembled baseplates are hung from the rail and the concrete can then be installed straight up to the bottom surface of the baseplate, in one operation. Special construction boltholders supplied to the contractor by Pandrol allow the anchor bolts to be very accurately installed. This enabled very rapid preparation and construction time for the installation contractor. Pandrol has been supplying resilient fastening systems for non-ballasted tracks for more than 40 years, from the early Shinkansen tracks in Japan to the more recent South Korean and Chinese high-speed systems. The Pandrol DRS assembly is well suited to high speed applications installed on pre-cast blocks, sleepers or slab. Pandrol has provided both technical product support and training for contractors on the installation of the DRS system. The MRTA projects are a great example of collaborative working to achieve the best possible solution for the customer. Pandrol DRS has also been specified for the Orange Line East, for which construction has not yet started. high reliability and safety – with Pandrol’s 3rd rail there is no need to control the thickness of the stainless steel. All Pandrol’s products are designed specifically for the railways and its technical engineers have extensive experience in 3rd rail. On this project, Pandrol designed, manufactured and supplied the 3rd rail, providing a detailed layout for approval by the customer. By working with Pandrol, customers can be assured that all track interfaces are managed and considered by an expert team. In addition, Pandrol provided theoretical classroom-based training for contractors, as well as practical training on site. This project is a typical example of different divisions within the Pandrol business working together to deliver the very best solution to the customer. It demonstrates the company’s commitment to innovation in design, manufacture and technical support to ensure the project is implemented to the highest standard.